These coins are sent to the grading service by a coin collector or dealer for authentication and grading. The result is what is known as a slabbed coin or slab. Technically the slab is the plastic case itself, however, coins that are encapsulated in these slabs are commonly referred to by the slang term - slab. The slab is made of two formed pieces of plastic with a circular recess to hold the certified coin and a rectangular recess to hold a certification card. The certification information is printed on the front of this card and the identity of the certifier is printed on the back. The coin and the certification information card are then place in the recesses and the pieces are sealed together. In this way you can look at the front side of the coin slab and see the obverseObverse refers to the front or face side of a coin. of the coin and the certifying information, and look at the reverse side and see the reverseReverse refers to the back side of the coin. of the coin and the name of the certifier. Since coin grading is not an exact process and is subject to human interpretation, some collectors or dealers might crack a coin out of its slab and send it back in to the grading service to be graded again, hoping for a higher grade. 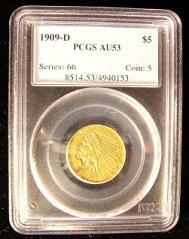 For example, the difference in value between two consecutive grades for some rare coins can be several thousand dollars. So if you sent a coin in to be graded and it came back as a high-end 65 worth $1,000 but as a 66 it would be worth $10,000 you would likely be willing to pay to have it graded again hoping to receive the 66 grade next time. You would probably consider it well worth your time and effort with the chance of having a coin worth $9,000 more. This is only an example for demonstration purposes, but there are many coins that are sent in several times hoping for a better grade. Getting the coin out of the slab can be a challenge however, especially without damaging the coin. These coin slabs are meant to be permanent and tamper-proof when they are sealed. They were definitely not designed for ease of removal of the coin. If you decide to attempt this, use caution or you may see your valuable coin fall to the floor while trying to crack open the slab and you will end up with a coin worth less than when you started instead of more. Your best bet would be to let a professional or someone with some experience handle this for you.